For a family of five 'Chasing Summer' nothing excites more euphoria than a week in the warm tropical climate of Thailand. After seven whirlwind weeks in the hot European Summer, we were ready for some rest and relaxation, some 300THB massages, some tropical drinks by the pool, and the kids were so excited for Kids Club! We have never had our own pool (and probably never will!) Having our own private plunge pool in our room was awesome! It was private, it was fun, and it was helpful. The kids could swim while baby Summer napped in our room. Who doesn't love a water slide?! With a lifeguard always watching over, there were no age or height restrictions, and no wristbands required, just hours of fun for all! 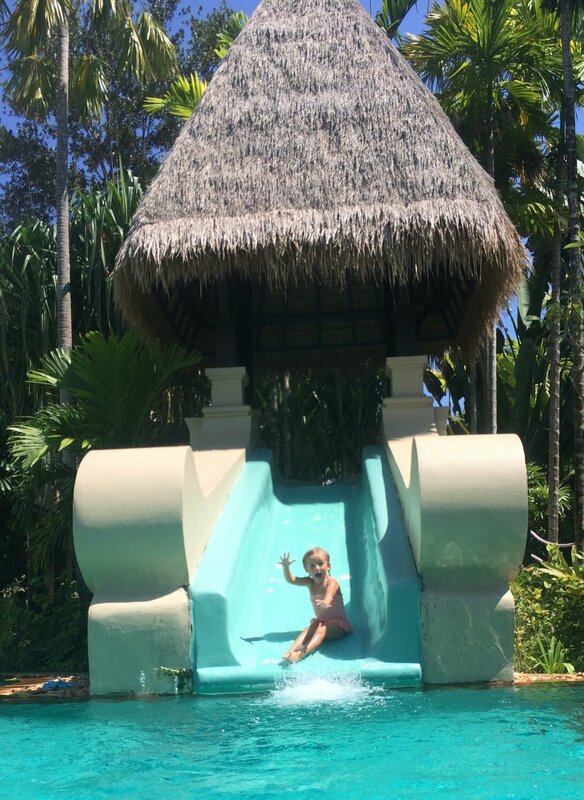 Hands up who wants to join Lola on the water slide! 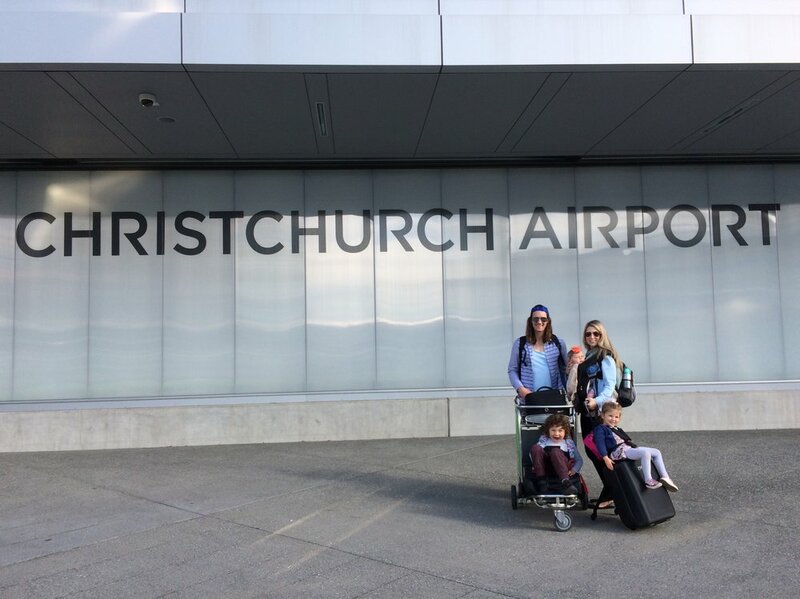 For those that like to travel with less - and let's face it, when traveling with kids, less is more! For a stroll down to the nearby shops and restaurants, just pop to the lobby and they will happily loan you a stroller. Karon Beach square is located at the front of the property across the road from the beach, and has a variety of restaurants and bars. One afternoon during happy hour Jono & I chilled on the daybeds at MINT sipping a tropical cocktail, while the kids played happily at kids club! They offer free children's meals (Including dessert!) with every adult main meal. The friendly staff will also drive you there in a golf buggy from the lobby. Although it is only a lovely 5 minute stroll through the pristine resort gardens. With five of us, getting set up to eat at a buffet, often takes ages, as one of us parents usually goes and fills up the kids plates first, but here there is a cute kid-sized buffet station, where the kids could easily reach and select their own food, and carry it back to the table without the worry of smashing plates all over the restaurant, as they have cartoon character plastic plates, cups and cutlery.....simple but genius! Yes that is right, chocolate hour! Not only does the resort have your standard happy hour, they also have chocolate hour! Being Movenpick Resort, each afternoon right around the time you need sugar hit, pick me up, they have an array of delectable chocolate treats on offer, for FREE! Movenpick Resort & Spa Karon Beach, offers three pools, however we spent all of our time at the main pool. It had everything we needed, and more. The watersilde, a swim up bar, kids areas, with fun bubbling fountains. Pool side food and beverage service, and here's the 'more'..... a call bell button at your sun loungers to ring for service! Although we spent hours in the amazing large pool, we loved that for a change we could walk directly across the road right on to the famous golden sands of Karon beach. The resort is located on the main beachfront road along Karon Beach. Within easy walking distance there are a string of shops and restaurants with everything that you need and expect in Thailand. Massages, suits, markets full of designer knock-offs, street food, restaurants with sharks, octopus and all sorts of other weird and wonderful food on display! Of course many a tuk-tuk and tour operator just waiting for you also. We took a tuk tuk up to the Big Buddha, who you can see perched on the top of a hill from the resort lobby. Our kids (and okay us too), were so looking forward to Kids Club, and it did not disappoint. So much so that when we went to pick the kids up they often wanted to stay longer! The kids have tried out a few Kids Clubs around the world, and this would definitely rank as number one on theirs and our list. With engaging carers, they always came back with fun stories to tell, braids in Lola's hair and pieces of art. Little birds kids club also run fun daily activities, and Bodie and Lola became Little Chefs one afternoon and made delicious healthy caterpillar sandwiches! For over 4's Little Birds club is free, for under 4's you can hire a babysitter to attend with them. Alternatively there is a large room next door, with a whole lot of toys, balls, books and games, where parents and little one's can hang out together and play. Amazing for rainy days! The founder of Movenpick once said "we aren't doing anything extraordinary, we are simply successful because we are doing quite normal things in an extraordinary manner"......... and this is why we pick Movenpick! Movenpick Resorts are currently running a special where you can save up to 30% off and recieve a $20 voucher. To book your Thailand holiday and secure this great deal, click here. To book your flights to Thailand click the link below. Disclaimer: We were guests of the Movenpick Resort & Spa at Karon Beach, and offered Media Discounted Rates, however all opinions are my own. This article contains affiliate links. If you book a stay with Movenpick by clicking through our site, we may receive a small commission. A romantic weekend away to celebrate your wedding anniversary, with a five, three & seven month old in tow might sound like wishful thinking....however Sonesta Maho Beach Resort was the perfect place to celebrate our seven years of marriage. Jono and I first came to St Maarten on our honeymoon. While only being there for a day, we fell in love with the half French half Dutch Island, Caribbean Island, and knew we had to come back. So here we are now as a family of five, back where it all began. We are spending a month on the island, and decided to break up our time at our HomeAway condo with a luxury all-inclusive resort stay, so headed to Sonesta Maho Beach Resort, situated on the edge of the famous Maho Beach, which is right at the end of St Maarten's airport runway. We felt welcomed immediately upon entering the lobby, and while checking in we were offered cold towels and champagne, and fruit punch for the kids. We arrived slightly before check in time of 4pm, however were given our all-inclusive identifying wristbands and were told we could start using all the facilities, and even enjoy some lunch and rum punch by the pool. We decided to use the restaurant reservation system in the lobby in order to book in at the a la carte restaurants, rather than the buffet, however unfortunately all five restaurants were fully booked that evening. As it wasn't our wedding anniversary until the following night we weren't concerned and were happy to try out the Ocean Terrace Restaurant Buffet and managed to book in to The Point Restaurant for a more intimate dining experience the next night. If you don't want to miss out on reservations, it is recommended that you email guest services prior to your stay to book well ahead. As, although the Ocean Terrace has a wide variety of lovely food, The Point is a much more refined, high quality dining experience. By the time we made our reservation, to our surprise, our room was ready (much earlier than expected). Note: A few months after our stay, Hurricane Irma destroyed the Sonesta Maho Beach Resort however it has re-opened, fully renovated and better than ever. The layout and views are the same, so this review is still rather accurate. For images on the new look, and rooms click here. We hope to return soon to experience the new resort, and do a follow up post. While the staff were out of work during the rebuild, they were all put through a hospitality course, so I imagine their customer service will now be even more amazing! We were fortunate enough to have one of the newly renovated rooms on the 8th floor. It was large and bright with modern fresh decor and a good sized balcony over-looking the pool, and had great views of the aircraft making their final approach, and landing overhead of the adventurous plane-spotting beach goers below. Our mini bar was stocked with beer, juice and soft drinks, and being in a Premium guest room we also had complimentary full sized bottles of rum, gin & bourbon! We could have sat back and enjoyed a drink and the view for hours, but this wedding anniversary weekend wasn't all about us, and the kids were itching to get to the pool. They kept saying we had a room with a great view, and boy were they right! We headed straight to the new children's pool, known as the Aqua Park where the kids played for hours over the next three days. With seven slides, and sea creature structures to entertain them. The pool was shallow enough for the kids to play in, while we relaxed back on the sun loungers with a Piña Colada! This is the only resort on St Maarten to offer a dedicated children's pool, however they are still allowed in the main pool, meaning us parents aren't exiled to a kids pool the whole time, making it a perfect place for families! . The kids enjoying the Aqua Park. The next day we took advantage of the kids club for a few hours, which caters for children aged 3-12. As soon as the kids entered they were swept up by the staff and added right into a came of chase. There is a large air conditioned indoor area complete with an inside slide from a a safe mezzanine level, and outdoor playground. We were instantly assured that they would be happy here while we had some child-free time at the swim up bar! Celebrating sevens years with some adult only time at the swim up bar. Later that afternoon, after collecting the kids we strolled down the beach to get an up close view of the planes landing and taking off. (Note, for safety reasons it is not recommended to go anywhere near the fence or directly in the firing line of an aircraft powering up for take-off. Certainly with kids) We did however stand under as they landed and all got enough of a thrill out of that). As previuosly mentioned, you do have great views from some of the rooms, and their are many vantage spots around the resort itself. Taking the fly like an aeroplane game to a whole new level. Each night after dinner we enjoyed the live music out on the deck on the edge of the ocean. The kids danced and the performers interacted with them. All in all Sonesta Maho Beach Resort has something for everyone, and is an ideal place for a family getaway, with a wedding anniversary celebration thrown in the mix! To book your stay at Sonesta Maho Beach Resort, click on the links below. Disclaimer: We were guests of the Sonesta Maho Beach Resort, and offered Media Discounted Rates, however all opinions are my own. WEEK 1 - Four Flights, Three Theme Parks, Two Hotels, One Bus, and a whole lot of fun! After a reasonably easy 12 hour overnight flight from New Zealand, we arrived at LAX just after midday. We were heading straight to Anaheim, for a couple of days at Disneyland & California Adventure Park, so this time we decided not to rent a car, and tried out the Disneyland Resort Express Shuttle Bus. I was a bit apprehensive about an hour bus ride with the kids after the long flight, and waiting for the bus to collect us from our arrival terminal. Standing curb side on a middle island at LAX for potentially an hour was not how we wanted to start our holiday! However, by some perfect timing miracle, literally as we got to the stop, the bus pulled up. The bus was large, comfortable and even had a toilet. You can pre purchase tickets online, here or just pay on board as we did. The price is $30 per adult, children 11 years and under are free per paying adult, infants are free. They have a large number of Anaheim hotels they drop off at, if like ours, yours isn't one of them, it will only be a minute or two walk away, which even with our 7 bags, 2 car seats, stroller and 3 kids was easy. I would recommend this as a convenient, stress free way to get to Anaheim after a long flight. Although Anaheim and Disneyland Resort offer some fantastic hotels, with great family themes and amazing swimming pools, we decided not to stay at one of those, as we have found with previous visits, that unless you an stay an extra day or two at the hotel when not visiting the Theme Parks, then you really don't have time to use and enjoy the facilities! In saying that, the Best Western Stovall's Inn (where we stayed) does have a great pool area, with 2 pools, 2 hot tubs and a new children's wading pool. We had a swim in the late afternoon the day we arrived, as we weren't heading to Disneyland until the next day. This was the only chance we had to use the pool! The rooms were slightly small, however still large enough for our family of five, and a baby crib! They were clean and modern and had a mini Kitchenette area. The staff are all very helpful, friendly and accommodating. They helped us purchase our Disneyland tickets right from the front desk. A generous buffet breakfast was included, which we always look for in a hotel in Anaheim. It saves time, so you can get to Disneyland nice and early and fills you up nicely before your big day! Each day we walked the easy 15 min walk via Downtown Disney to the parks. For an affordable, convenient stay, we will choose Best Western Stovall's Inn again. You can read our previous post on our Top 5 Tips for Disneyland with toddlers, which goes into a lot more detail, however here are a few extra tips we learnt this time. 1. If you only have two days and want to do both parks, I recommend purchasing the one park per day ticket, as you really need a full day at each park. Especially if your children are still young enough to enjoy the characters and young children's ride, but also tall enough (42'') to do most of the bigger rides. You will waste time trying to park hop, and also waste money, as the park hopper tickets are more expensive. (For 3+ days the park hopper ticket is a good option, as after you have done it all, you can hop between the parks to redo your favourites, or see shows. 2. 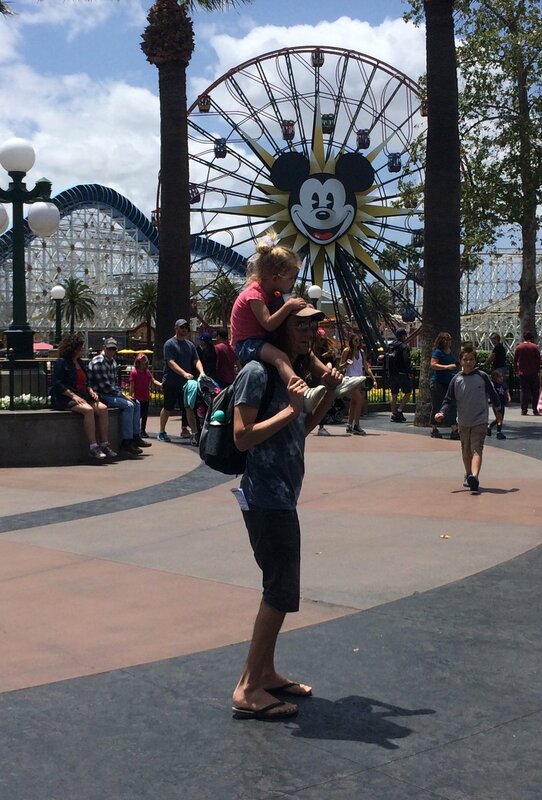 If your child (like Lola) will get upset when they realise that they are too short for some rides, then I would wait until they are 42'' tall. There are a lot of rides at California Adventure park she missed out on, that broke her heart, especially when Bodie got to ride! (48'' is the next height level and the maximum restriction, however there are only a few of these rides). 3. A great improvement since our last visit is that they now have a cast member letting you know when the line to have a photo and grab an autograph with the characters is closed, and will advise you what time they will be back. No more waiting in line for ages to get to the front and then being abruptly cut off! 1. Parent swap as mentioned in our previous post still worked well this trip. It was a surprise to find we could completely swap riders. As in Jono and Bodie could go together first, while I stayed with Summer, then Lola and I could jump the queue and have our turn! By using this option, and FastPasses we felt like we owned the park and almost never had to wait longer than 10mins! Bodie gave Jono the name, Fast Pass Master! 2. Strollers are not allowed in most queues and attractions, (such as Star Wars Launch Bay). So while it is great to have a stroller, sleep times might be easiest in a carrier, so that for the rides that the baby can go on with the whole family, one of you isn't stuck outside sitting with the stroller. In saying that babies must be awake for the Roger Rabbit's Car Toon Spin. (Although this was a rather psychedelic, loud, spinning ride, that in hindsight I wouldn't take a baby on to! They are also allowed on the teacups practically from the day that they are born, but again I don't recommend it for babies, and luckily Jono and Bodie arrived just as Lola and I were about to board, and I passed Summer over the rails to Jono, - Summer is a spewer at the best of times!!! 3. If you go on It's a Small World just prior to the night time Electrical Parade, and can't find your stroller when you get off, it's not likely to have been stolen, but just moved to a new stroller parking area behind the shop, as they need to clear the original parking area for the parade! As you then have no clue where in the huge pool of strollers it will be, it is a good idea to tie some sort of ribbon or name tag on to the handle in order to make it stand out from the rest! Yet again, we had a great couple of days at Disneyland and California Adventure Park, although they can be long days, with a few tears, it is all worth while to see the joy, delight and sometimes nervous excitement in the kids eyes! On Day Three we made the easy 1hr drive to Legoland, and yet again had a great couple of days at Legoland and the Legoland hotel. You can read our previous post here. The highlights this time, were the Disco Dance Parties from 6pm each night at the hotel, and the fact that Lola was tall enough for most of the same rides as Bodie, as the height restriction here for the majority of the rides is 36''. By staying at the hotel you get early access by half an hour. A second day ticket is only $25, when purchased on your first day. After four exhausting days at Theme Parks we boarded a red-eye flight to St Martin via JFK (in which all three kids slept like champs on both 4 hour flights!) We were leaving a whole lot of man-made fun behind, to indulge in a whole lot of natural beauty and beach fun for the next month, staying in our Caribbean HomeAway vacation rental in St Martin! Below our our top reccommedations for a fun, successful day at Disneyland & Legoland! DISNEYLAND - Our top 5 tips for Disneyland with toddlers!